The Mozilla repository has no fewer than 800 add-ons for Thunderbird alone. Keeping on top of this collection is difficult. In this article, I'll introduce five must-have add-ons. In many cases, the Thunderbird mail client works quickly and efficiently, but no program can be a master of everything, and in some cases, functionality has been sacrificed to keep the program lean. Add-ons help users by restoring the features the developers left out. To manage these practical helpers in Thunderbird, go to Tools | Add-ons…. The Extension Manager (Figure 1) lists extensions, language packages, and themes (i.e., files that define the appearance of the GUI). The Download extensions link takes you directly to the Mozilla repository , which offers numerous add-ons. Figure 1: The Extension Manager gives users centralized add-on management. When you get there, you can download the .xpi file and press Install… to integrate the add-on with the extension manager. Firefox or SeaMonkey users need to right-click the corresponding XPI file and select Save target as…; otherwise, the add-on will end up in the browser. Additionally, many add-ons are available directly from the package managers of most Linux distributions, although the version might not be the latest release. 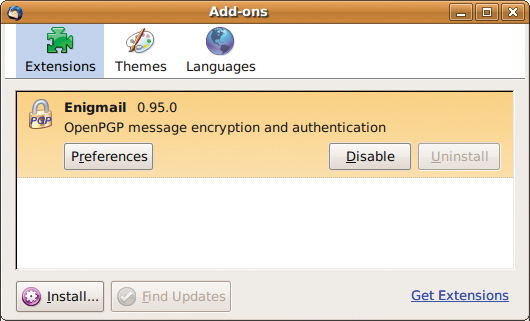 For example, Ubuntu has an enigmail pack for the Enigmail plugin. Because most extensions have an integrated, automatic update mechanism, you can simply install from the Mozilla repository to get the latest version. If you use a single account to manage multiple mail addresses – or Identities in Thunderbird terms – you will be familiar with this problem: When you reply to a message, the sender address in the header is wrong and the mail might not even reach its recipient. A workaround for this involves setting up a separate mail account for each address; however, this tends to cause confusion. The Correct Identity add-on  helps to select the right identity for a reply on the basis of the recipient's address. Installing the helper program is easy – just use the Extension Manager, which is also where you configure the plugin. The clear-cut dialog provided by the add-on shows you two tabs: Selection and Detection. Selection is used to specify the identity you want to use as the default in the context of each account. To do this, select the account below Account and the matching identity below use. Correct Identity really comes into its own when you enable the attempt to find and use an identity that appears in its recipient list option. Then you can use the second tab to specify the rules to apply for selecting a sender ID (Figure 2). Because a separate ruleset is available for each identity, you must first select Identity to choose one. Figure 2: The Correct Identity add-on helps you manage multiple sender addresses for each identity and includes a ruleset for email address selection. Also, you can enter a string for simpler filter rules (Figure 2). 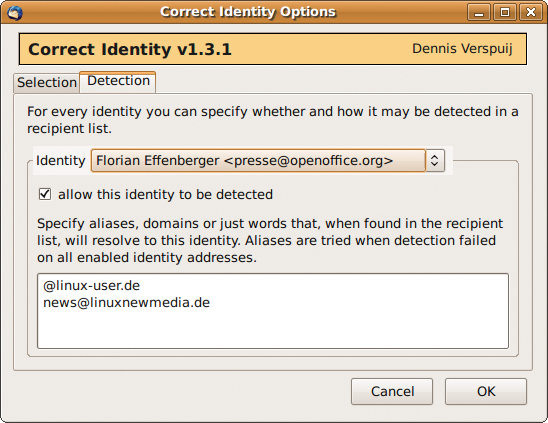 In the previous example, Thunderbird automatically selects the sender address of presse@openoffice.org if the recipient is news@linuxnewmedia.de or the message is directed to any recipient in the linux-user.de domain. 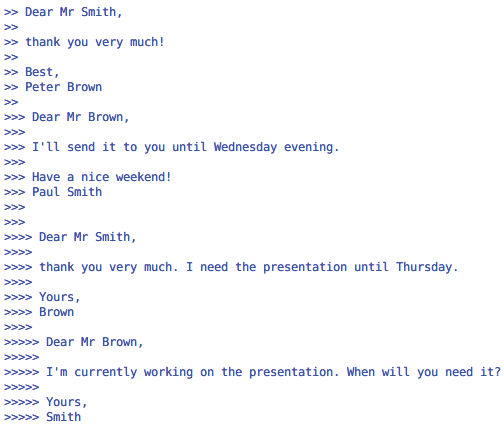 However, automatic sender selection only works for replies to email, not when you are creating a new message. When creating a new message, you will still need to select the identity manually. Losing track of extended email conversations is easy, especially on mailing lists and in mail that includes too many nested quotes (Figure 3). Manually removing superfluous quotes is time-consuming. The small but impressive NestedQuote Remover add-on  takes this task off your hands. Figure 3: Multiple-level quotes can be removed automatically or by pressing a keyboard shortcut in NestedQuote Remover. After using Extension Manager to install NestedQuote Remover, you can configure the helper directly in the same dialog. The first setting relates to the maximum permitted quote depth (i.e., the number of quoting levels that you want to keep in your replies). In practical applications, the default of one level worked well. Selecting automatically delete nested quotes tells Thunderbird to remove any quotes below the preset depth when you reply to mail. As an alternative, you can enter a Shortcut for semi-automatic quote removal in replies. As a default, the developers have assigned Ctrl+Shift+N, which means that you can decide individually for each message whether to keep or remove the quote.